Apple on Tuesday announced it has launched a new 128-gigabyte model of the fourth-generation iPad with Retina display, doubling the previous maximum capacity offered. 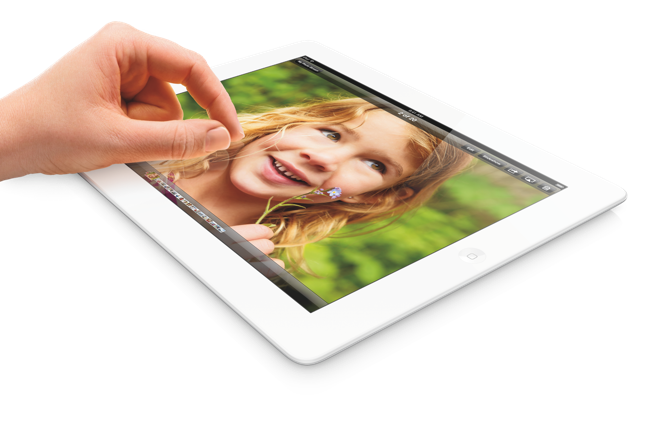 The 128-gigabyte version of the fourth-generation iPad are available starting Tuesday, Feb. 5 in black or white. They will have a suggested retail price of $799 for the Wi-Fi-only model, while the cellular-capable model will sell for $929. Apple's 9.7-inch iPad lineup now extends to four different capacities, starting at 16 gigabytes for the entry-level model. The smaller iPad mini still tops off with a 64-gigabyte model. The announcement of the new iPad model comes only a few days after it was discovered in the newly released iOS 6.1 software update that Apple had included references to a new iOS device with a storage capacity of 128 gigabytes. Previously, the iPhone, iPod touch and iPad lineups all maxed out at 64 gigabytes. "With more than 120 million iPads sold, its clear that customers around the world love their iPads, and everyday they are finding more great reasons to work, learn and play on their iPads rather than their old PCs, said Philip Schiller, Apples senior vice president of Worldwide Marketing. "With twice the storage capacity and an unparalleled selection of over 300,000 native iPad apps, enterprises, educators and artists have even more reasons to use iPad for all their business and personal needs." In announcing the new 128-gigabyte iPad, Apple boasted that virtually all of the Fortune 500 and over 85 percent of the Global 500 currently deploy or test the iPad. It noted that companies use large amounts of data, including 3D CAD files, X-rays, film edits, music tracks, project blueprints, training videos, and service manuals. Aside from the higher storage capacity, the new 128-gigabyte iPad with Retina display is unchanged from the previously released fourth-generation models. It includes the Apple-designed A6X processor, a 9.7-inch Retina display, and forward facing FaceTime HD camera. Apple also noted the iPad runs over 800,000 apps available on the App Store, including more than 300,000 apps designed specifically for iPad, from a wide range of categories including books, games, business, news, sports, health, reference and travel. iPad also supports the more than 5,000 newspapers and magazines offered in Newsstand, and the more than 1.5 million books available on the iBookstore.